The love of oneself and that of the country is best assessed in times of difficulties and challenges. 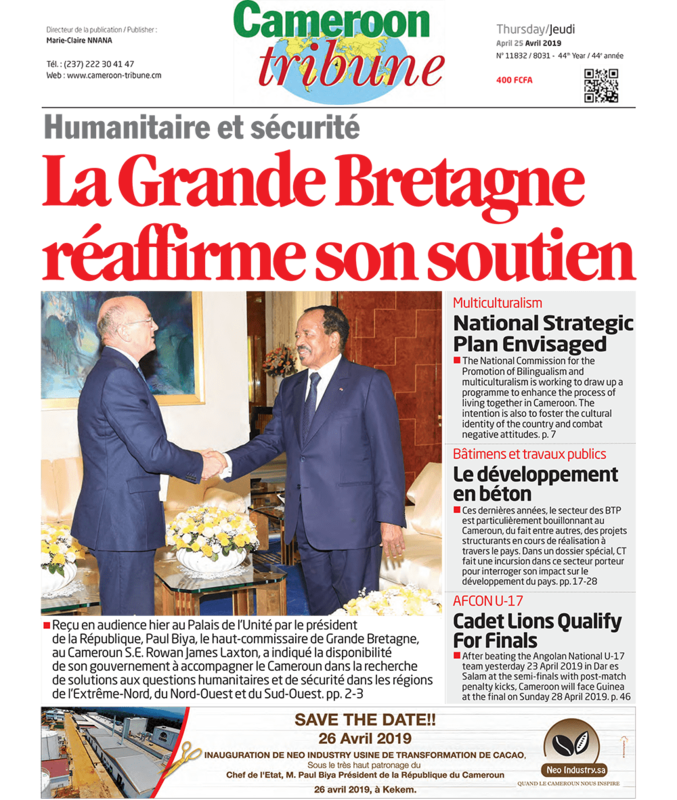 Cameroon in recent times has been facing a number of very trying times, unpleasant surprises; in fact, crises that must be urgently handled with prudence otherwise they can get out of hand and we find ourselves quenching fires that could have been prevented. Whether it be the ongoing premeditated machinations by some persons to see that Cameroon does not host the 2019 African Nations Football cup tournament, the atrocities of Boko Haram, the embarrassing reports of Amnesty International about Cameroon’s maltreatment of these perpetrators of misdeeds, or the Anglophone crisis, there is enough to prove that the pride for which Cameroon is known since 1961 on the African continent could be relegated to past glories if we do not face urgently and wisely the challenges at hand. The challenge to confront with patriotism these tests of love and political maturity concerns Cameroonians at home and abroad, especially today that the social media facilitate the dissemination of information that fuels flames of hatred and disintegration, when we need dialogue and redress of disturbing trends. With the efforts so far made by government to prove its willingness to redress urgently most of the causes of the crisis, some Cameroonians at home and abroad do not seem to regret their retrograde move for violence and disintegration. Worse, those who seem to see no need in dialogue and end of ghost towns in the Northwest and Southwest Regions are some compatriots who for their, own interests and those of their children, are abroad. And, what a lesson that they failed to learn, from their compatriots also abroad who returned home in June to talk investment back home, and cooperation aimed at boosting international trade and industrialization! Some claim to support Cameroon’s hosting of AFCON 2019 but regrettably ignore that if we do not end our disturbances back home, those against us can add this to their claims of inadequate soccer infrastructure for the hosting of the games. Regrettably, those who tarnish the image of their country while abroad forget that they greatly mar their own personalities in their host countries! This is inadmissible. Furthermore, what a surprise that those at home who could be active in dishing out the advice needed, or contributing positively to redress disturbing trends, harp on failure when redress errors have already been made in the onerous efforts to sensitize and inform those unaware of what is happening! As the new school year (2017-2018) draws nearer and proprietors appeal for a serene back to school scenario, all Cameroonians with a concern for their country and its future, should relinquish all forms of narrow patriotism, greed, and mob psychology, so as to sensitize compatriots and friends abroad to cooperate genuinely for an end to the crises, that rob us of our pride as a united nation. For, without this spirit, we will continue to bring up children who will keep looking for greener pastures abroad even if it means perishing in the Mediterranean Sea or living forever abroad at the expense of nation building. Time indeed is come for us to think seriously about the challenges we face and work together to retain our pride of yesterday and the years to come.